As everyone has surely noticed, meteorologists are having considerable trouble ‘forecasting’ the rain / snow line, duration of snow events, etc. According to the “weather forecast” (aka geoengineering estimation), it was supposed to be snowing last night. In reality in amounted to nothing but drizzly mess. As with all things geoengineering, there is a perfectly logical and reasonable explanation for all of this. As illustrated by Al Roker however, we obviously won’t be getting it from the meteorologists. All of these things are directly related of course. In order to understand these drastic temperature fluctuations and the sudden and unpredictable precipitation state changes, one has to understand the Frequency Activated Ice Nucleation Field. Every single day the Frequency Activated Ice Nucleation Field cycles starting from (somewhere) in Canada, and pushes down through the United States – completely covering both continents – and then dissipates / recedes back to Canada. This cycle is restarted, every single day. Also like all things geoengineering, this reality is plainly visible. It is most visible on two GOES Satellite views: National Infrared Color 1, and National Base Reflectivity (Winter). On Infrared Color 2, the cycle is so dramatic, it looks like there is an enormous yellow spotlight in space that passes across the surface of the Earth down to Florida, and then passes back up to Canada – every single day. This field is driven South through the United States by a series of Nexrad Sequential Heterodyne Waves. I watched this alarming visual cycle for probably a year, before I was comfortable with my understanding of what I was looking at. 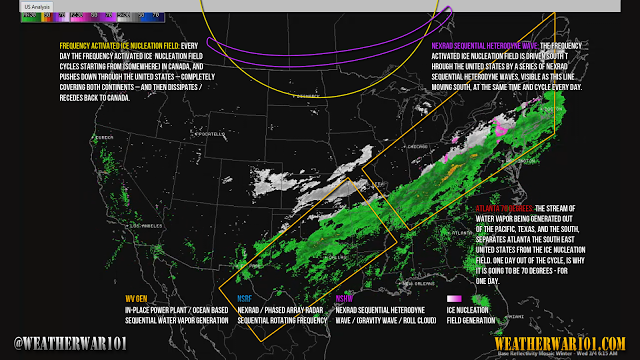 The National Base Reflectivity (Winter) view, is a little easier to grasp, because it is actually color coded. The ‘White’ areas indicate snow, and the ‘Pink’ areas indicate sleet, slushy rain, etc. However, if you spend some time studying extended GOES sequences (instead of the five or six frames often from a single Nexrad station that meteorologists offer as “evidence”), you will see that we don’t have ‘snow storm systems’ that move across the country dropping snow. We have massive generated streams of Water Vapor that when they hit the border of the Frequency Activated Ice Nucleation Field, instantly “flash over” into snow. Remember… perspective is everything. All of this is happening within the context and reality of “Global Warming” (Global Burning) and “Climate Change” (Climate Collapse). It’s the reason why Atlanta is going to briefly be 70 degrees today in the middle of the ‘never ending winter,’ but I’ll get to that in a moment. 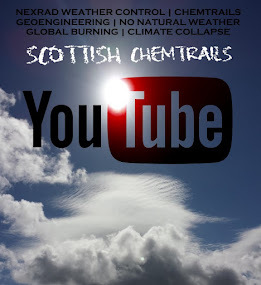 So, one must understand the process and sequence to understand the rain / snow dilemma, why the geoengineers are having the difficulty they are, and why that translates into ‘meteorologists’ having to explain themselves out of not being able to forecast snow. Water Vapor is sequentially injected into the atmosphere from Power Plant / WSAC as the system moves across the country. This is obviously Steam, and is obviously hot. Making that Water Vapor cold enough to fall to the ground as snow, in a short enough time period (before it falls as rain or dissipates), in an atmosphere that is clearly too hot to support it, requires (Frequency Activated) Artificial Ice Nucleation. I won’t get into the mechanics of Frequency Activated Ice Nucleation at the moment, but put simply – the temperature is artificially lowered though a combination of Frequency and Active Components in the air. In fact, meteorologists are talking about this reality all the time, when they are talking about “Temperature Inversion”… whether they are aware of it or not. "Temperature inversion, a reversal of the normal behavior of temperature in the troposphere (the region of the atmosphere nearest the Earth’s surface), in which a layer of cool air at the surface is overlain by a layer of warmer air. (Under normal conditions air temperature usually decreases with height.)" In January 2015, meteorologist B.J. Simpson made his presentation at the 20th Conference on Planned and Inadvertent Weather Modification, called “Anthropogenic Snow: A Case of Industrial Plant-Induced Snowfall in the Texas Panhandle.” In fact I included his presentation in my recent video analyzing the Valentine’s Day Blizzard Neptune – available here. This “Low Level Inversion” (reversal of the normal behavior of temperature in the troposphere) that is necessary for Plant Induced Snow, is the Frequency Activated Ice Nucleation Field. In 2015, this “Low Level Inversion” condition is necessary for snow to fall – period. I’m sure any meteorologist will agree (or admit) to this. Lack of wind and wind shear is required for Artificial Ice Nucleation and manufactured snow, simply because heavy winds will just blow away the Frequency Activated Ice Nucleation Components, and that’s the end of the cold. Again, this is antithetical to any “natural” understanding of weather – in which wind in the cold, would just make it colder. This is the reason it is going to be 70 degrees in Atlanta today. 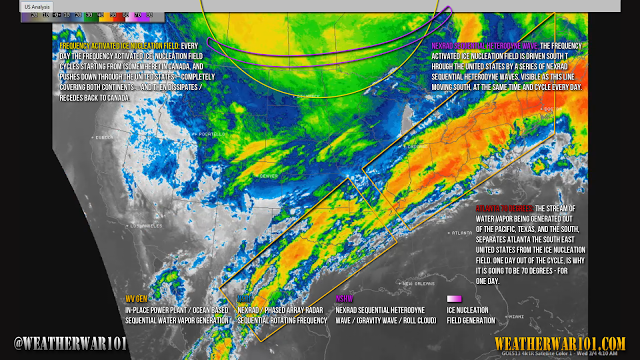 Over the last several day that area has been the direct conduit for the stream of Water Vapor being generated out of the Pacific, Texas, and the South, and has undoubtedly quite thoroughly streamed all of the Artificial Ice Nucleation Components North. Additionally, the areas North and West of the Atlanta area are awash with massive Water Vapor Generation to fuel this current storm system. All of that Water Vapor is blocking the Frequency Activated Ice Nucleation Field from traversing south all the way to Florida, as (at this point) it does almost every day. That area of the country won’t see the Frequency Activated Ice Nucleation Field again until the next cycle… hence, it’s going to be 70 degrees there today. This provides a brief glimpse, of what the temperature would be – without constant geoengineering. As my viewers know, I don’t particularly care what the meteorological and climate community’s (or individual meteorologists or climate scientists) reasons or excuses are for not being able to see, recognize, or admit to this glaring reality. 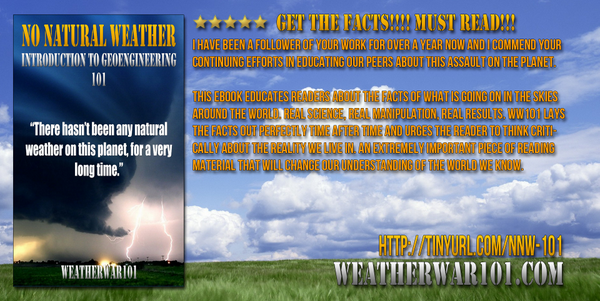 In 2015, the weather is manufactured… period. However, they are not going to be able ignore this voluminous research and the reality streaming out of this work – indefinitely. As I said in my CIA Response article, from my perspective the entire “Geoengineering,” “Climate Change,” “Global Warming,” and “Meteorological” communities might as well be talking about how the Earth is Center of Solar System, or how the world is flat. Anyone uttering the term “Mother Nature” in connection to weather on this planet is woefully ignorant of reality – or deliberately lying. So… I’m in no hurry. These people will have to face this reality, will have to examine this research, will have to admit to its validity, and then – will have to explain themselves. The longer, as one giant collective entity, these groups pretend they “see nothing,” it’s just that much more suspicious and incriminating. My scientific evidence cannot be disputed. That’s why none of these groups dispute it. It can’t be ignored – either. As always, I encourage any meteorologist, climate scientist, geoengineer, government official, or any other genuine individual on the planet to email me to discuss any aspect of this reality at all. I’ll simply preface by saying this. If you are unfamiliar with my work and methodology, know for a fact – I can prove any of the statements I’ve made… a hundred times over. If you’re intent is to deny or dismiss any of this reality, you will at best find yourself thoroughly embarrassed, but in all likelihood – will only expose your ulterior motives and intentions. That’s not ego speaking… it is once again demonstrable fact. Anyone questioning that reality, should familiarize themselves with my work… before saying anything at all. Anyone genuine however, has exactly nothing to fear and everything to gain from dialog with me, on any aspect of this planetary reality. I do not bite… but I am right.